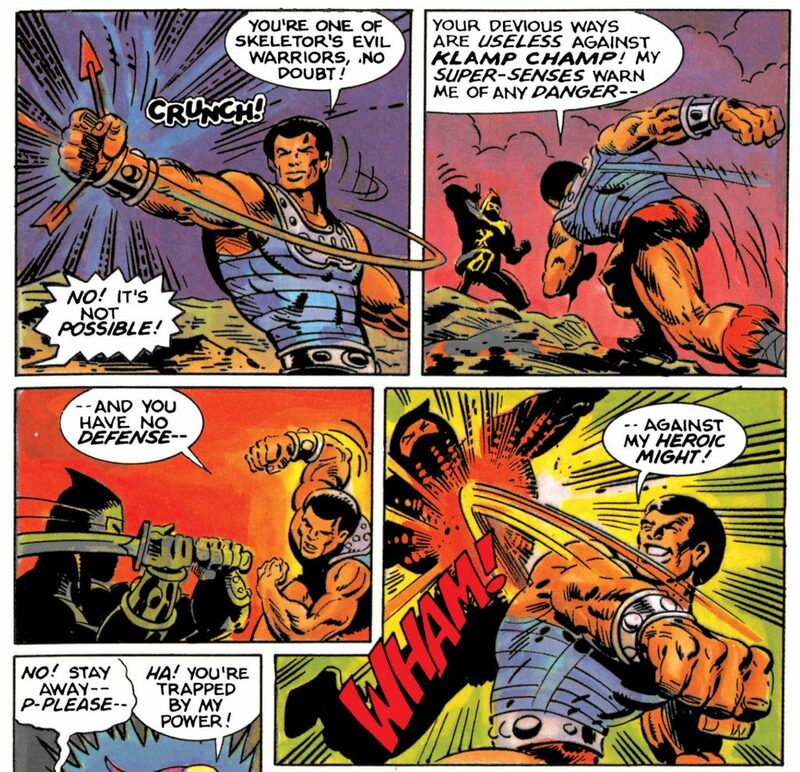 Ninjor is perhaps the most G.I. 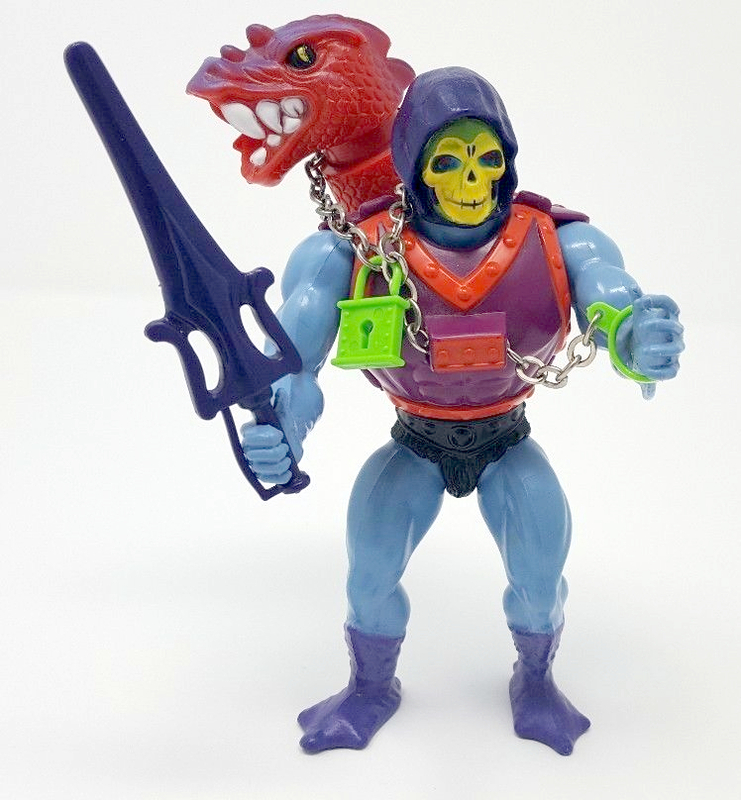 Joe-like figure in the Masters of the Universe series. 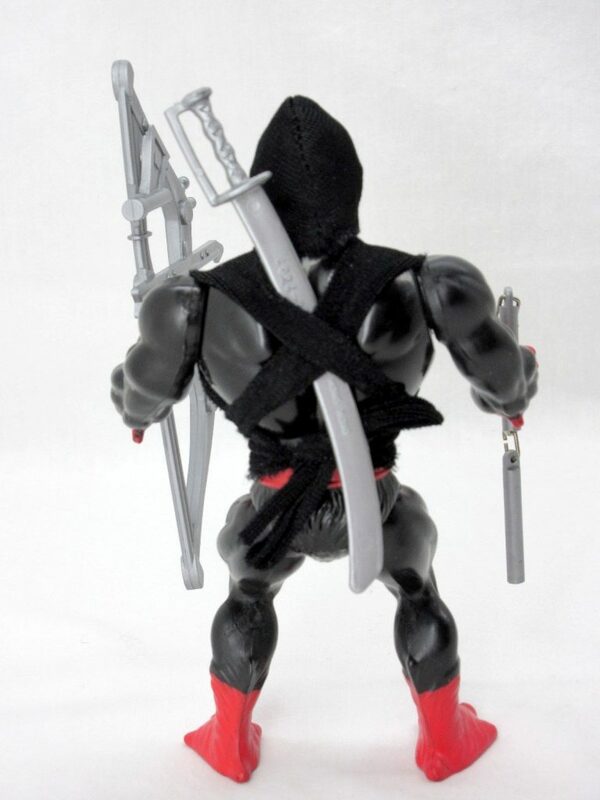 He certainly feels like He-Man’s answer to Snake Eyes or Storm Shadow. 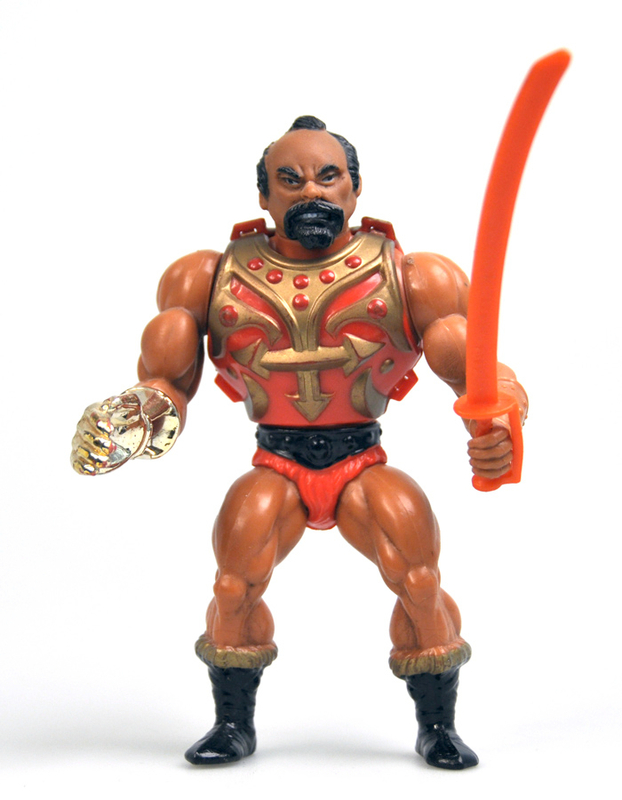 He doesn’t exactly fit with the general science/sword and sorcery motif of MOTU, but then of course by the last couple of years of the line it had become a something of a kitchen sink of ideas. 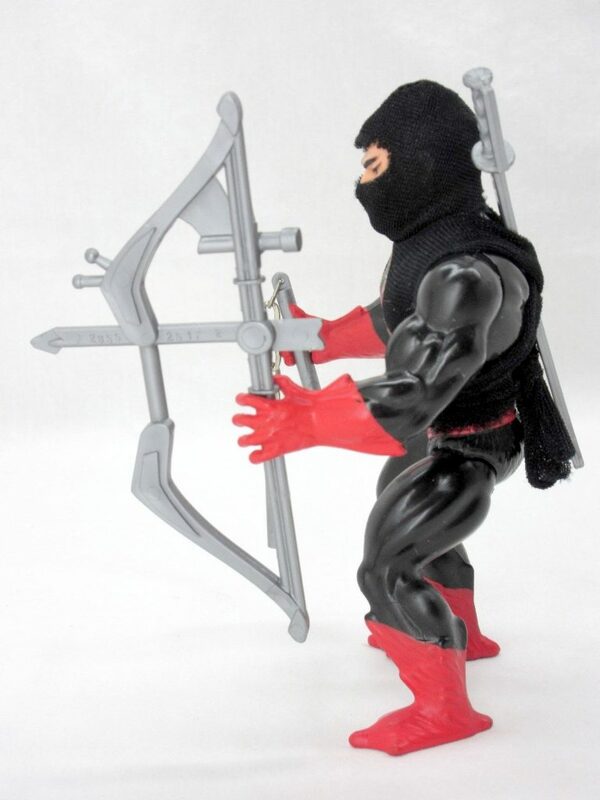 Early on in my Mattel career , I was given the task to do four figures using minimal new tooling. 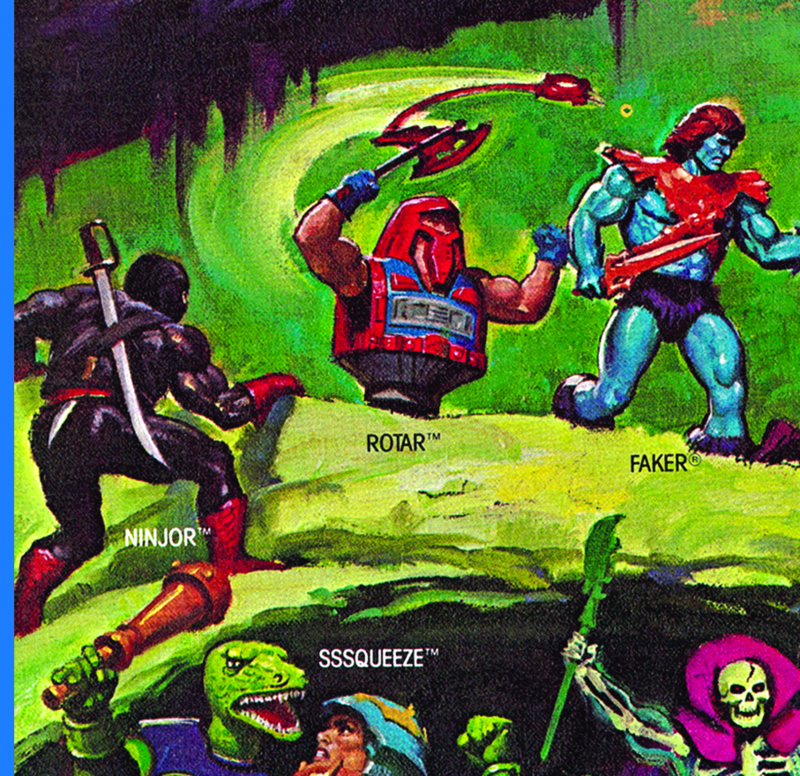 They were Scareglow Skeletor, King Randor, Ninjor, and Clamp Champ. 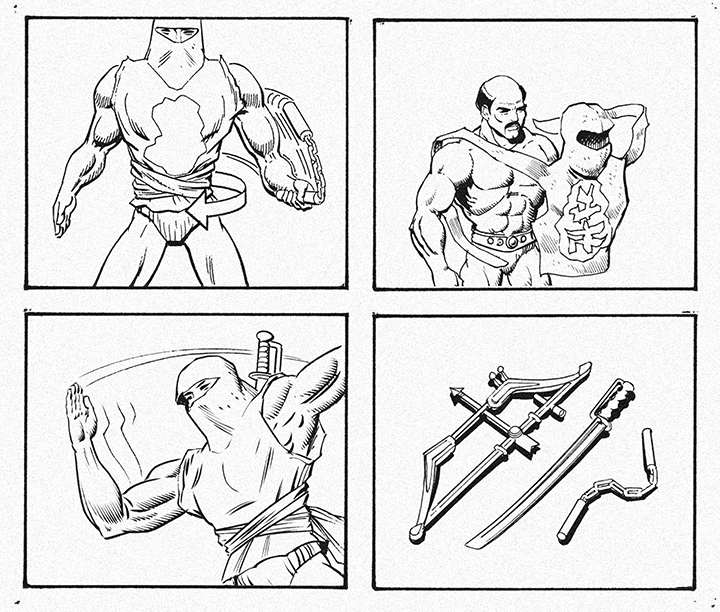 The four characters had already been conceived of and the concepts sold in, so all I had to do was to make it happen. 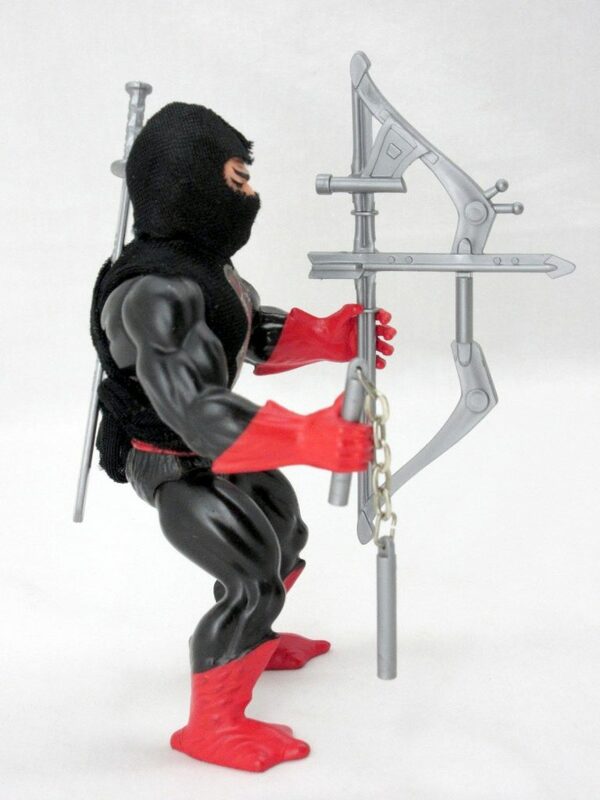 Ninjor came with three weapons – a sword (borrowed from Jitsu), a bow and arrow (borrowed from the Eternia playset) and nunchucks. He also came with a cloth costume that obscured most of his face. 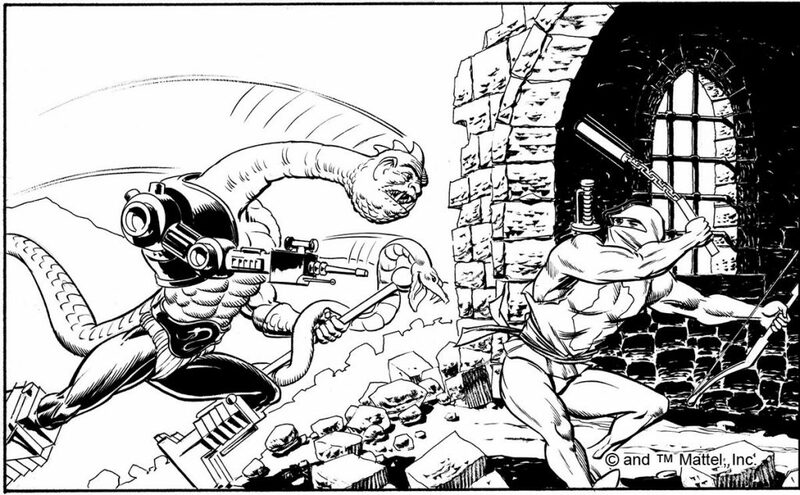 He borrows the spring arm action feature from Fisto and Jitsu, which allows him to attack with his sword or nunchucks with his right hand. 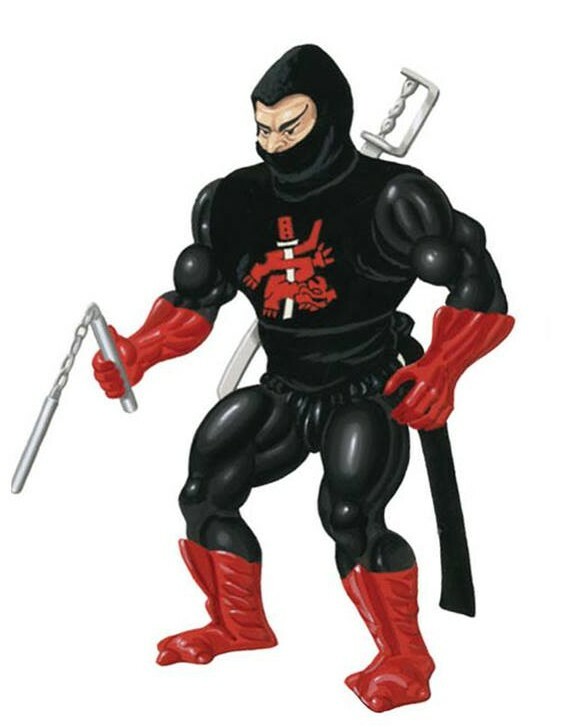 Jitsu was of course also a martial arts themed figure, although he looked more heavily armored rather than stealthy. 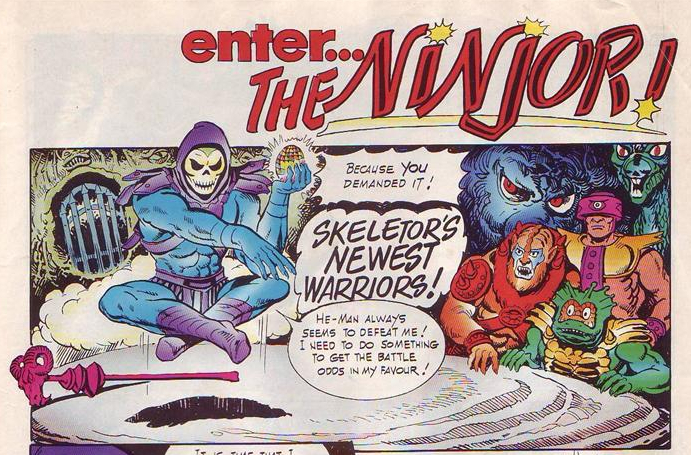 The one piece of his design that separates Ninjor from a typical terrestrial ninja is his three-toed feet, borrowed from Dragon Blaster Skeletor. 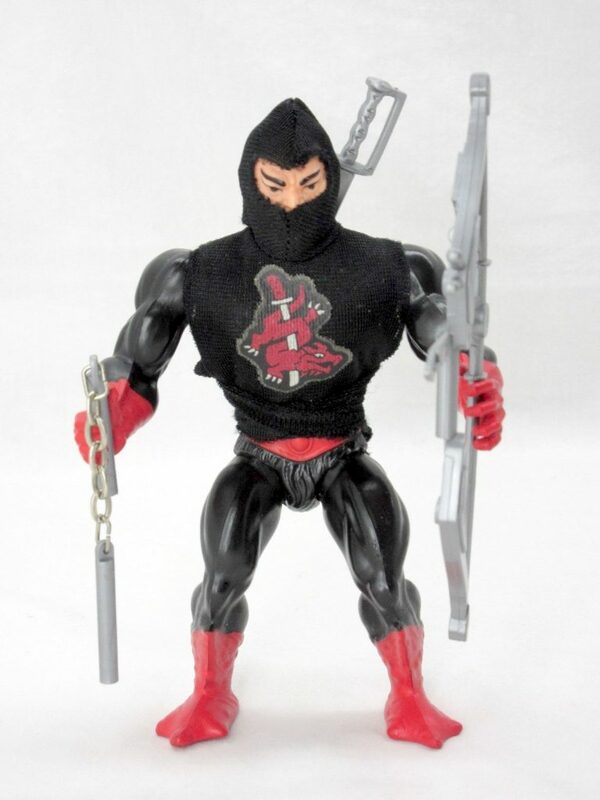 At one point Mattel was planning to reuse the Ninjor concept to create a white-costumed ninja warrior, making the Snake Eyes/Storm Shadow comparison all the more apt. However, these plans never came to fruition. 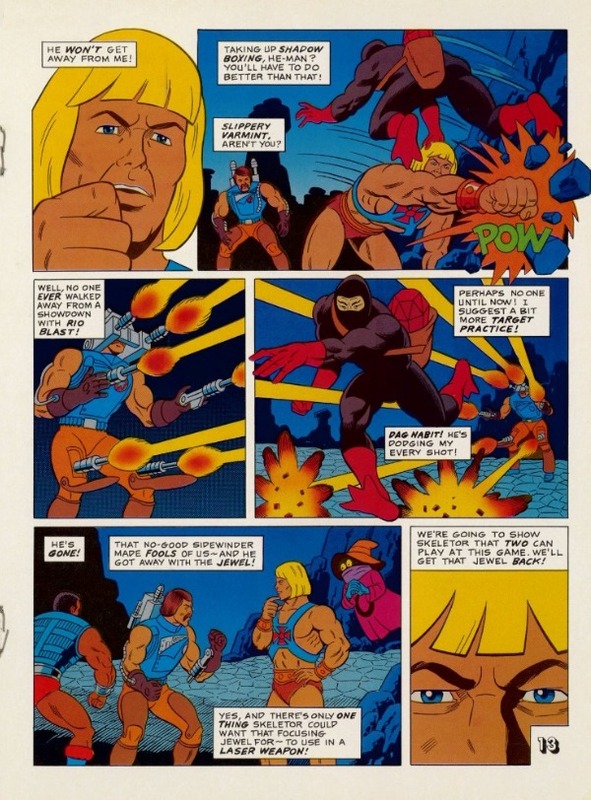 In the comic, you can see Ninjor with the arms and legs of He-Man (all in black) rather than Skeletor. That may represent an earlier concept design for him. 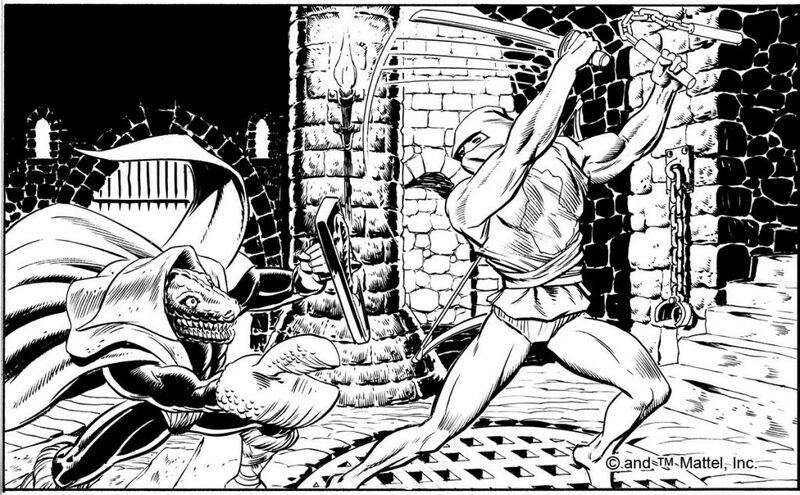 Power: Mastery of many martial arts weapons. 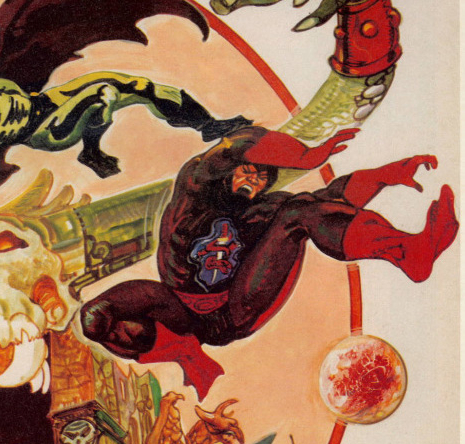 Character profile: This awful assassin has come from another world to serve Skeletor. 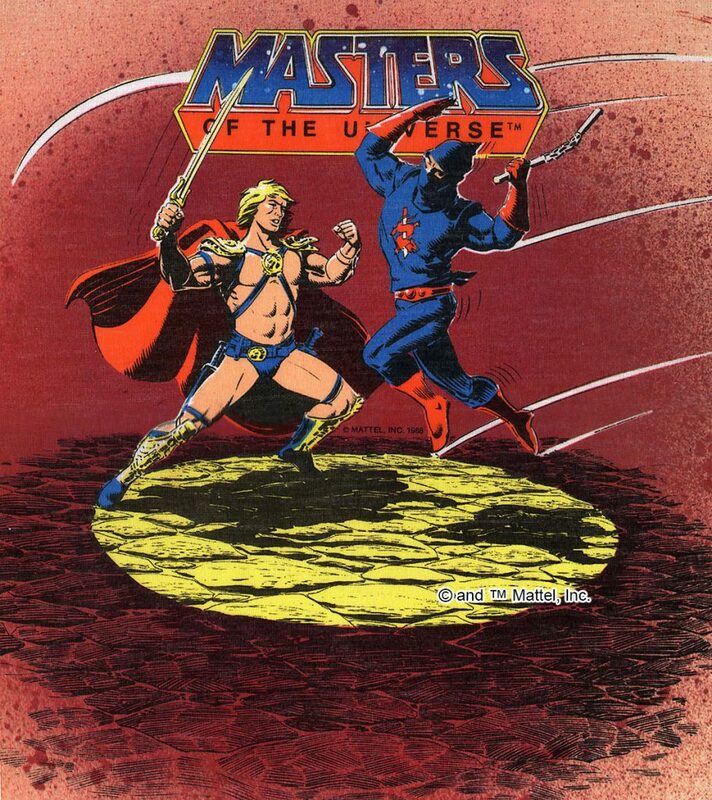 His mission is to eliminate Heroic Warriors one by one, until He-Man no longer has any help in defending Eternia. 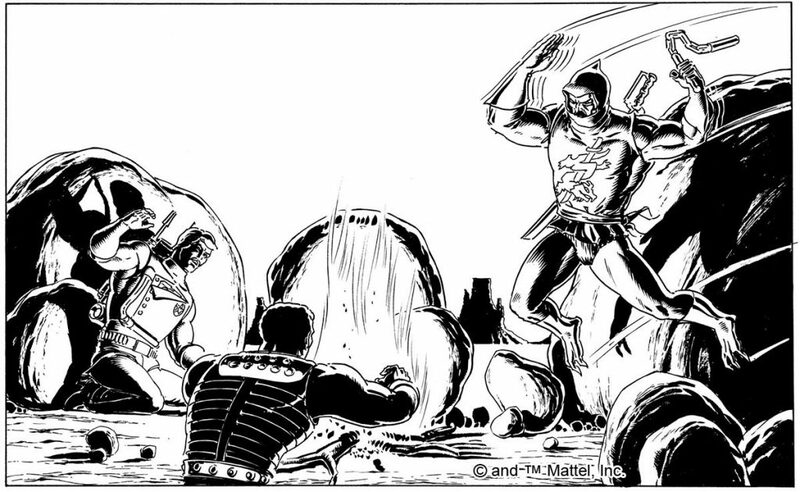 Ninjor always moves with great speed, skill and silence. 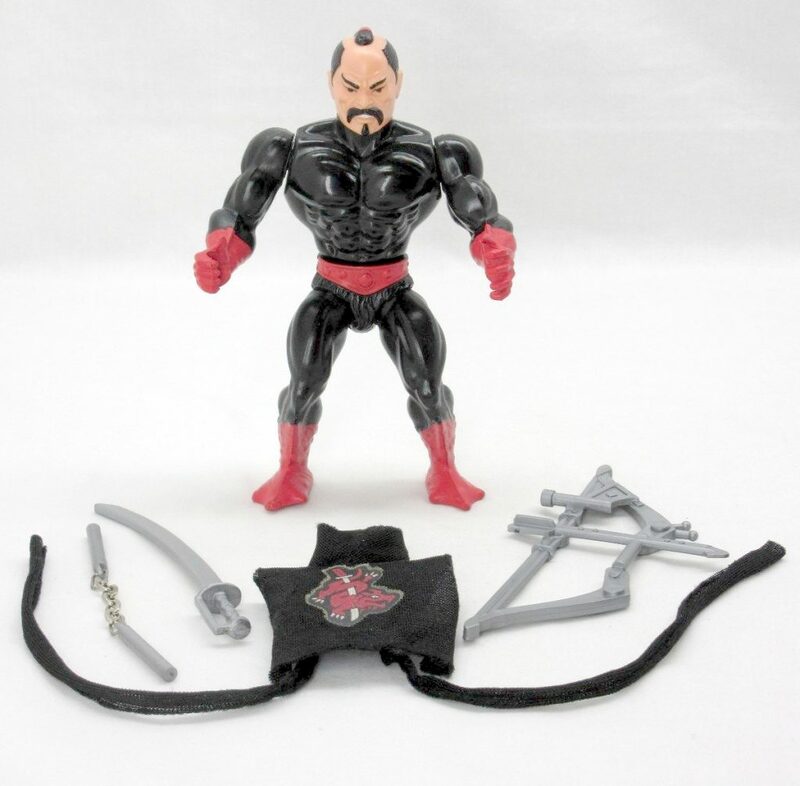 Ninjor isn’t the most distinctive-looking figure in the world, but he does look rather smart and has some fun features and accessories. Interesting, I’ll have to check that out. Thanks Matthew! 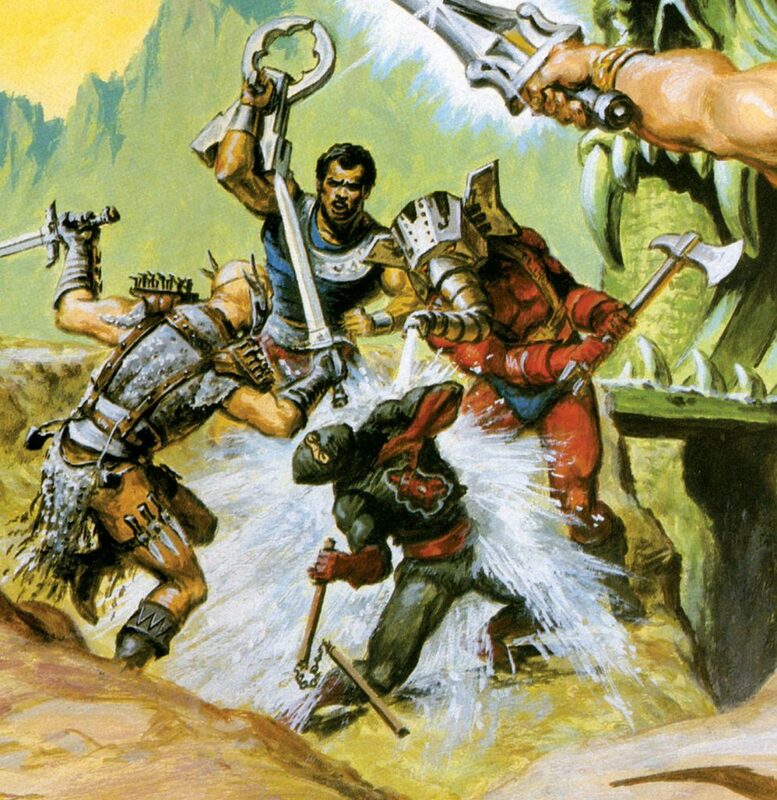 I would have loved to see the good version, they were planning. 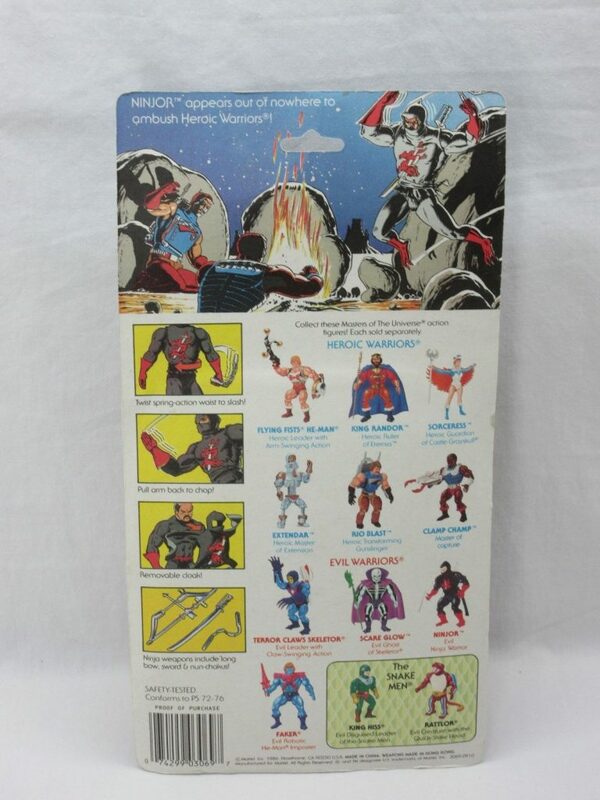 He also has a pretty lengthy storyline in the newspaper comic strips. Thanks, I’ll have to look for that! 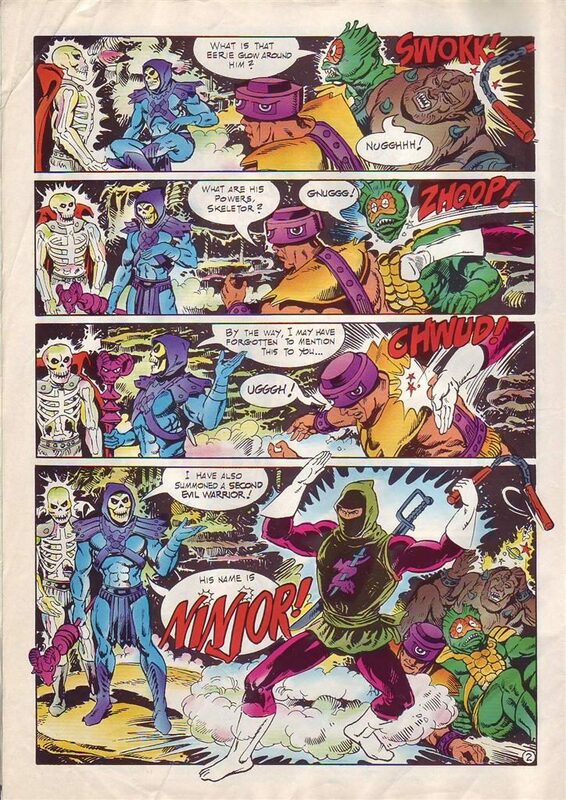 Ninjor for me has always felt like a rather shoehorned-in character to the franchise, with relatively little MOTU-esque about him. 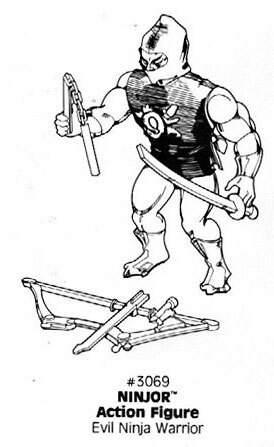 In fact, to anyone unfamiliar, they could even be forgiving for thinking he was a knock-off, using a bootleg MOTU body and other weapons. 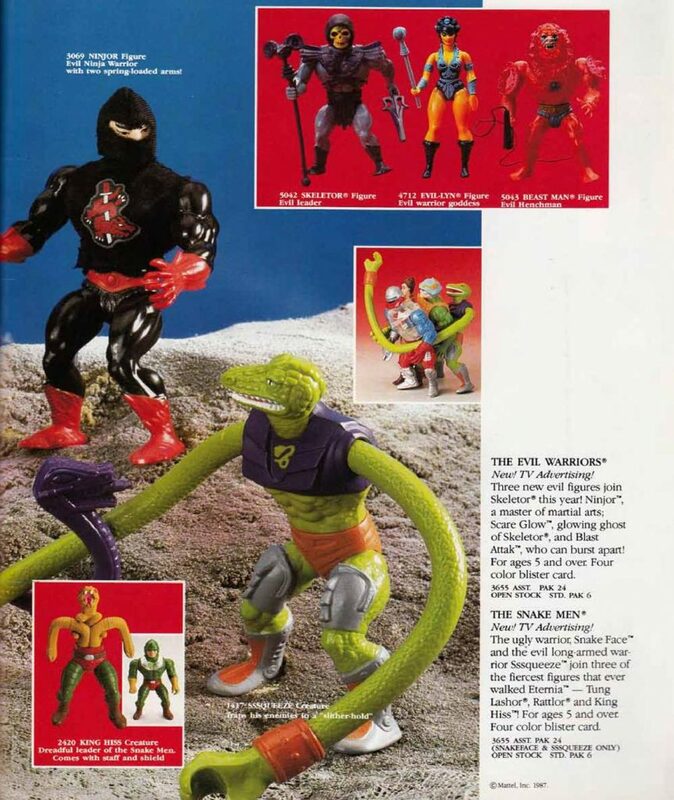 He really feels like a half-hearted, last minute, “Okay, what ELSE can we stick in to complete this final wave” effort, presumably seen as an easy cash in on both the Teenage Mutant Ninja Turtles, and various other ninja-related franchises of the latter half of the 1980s. He also really sums up to me the rather unfocused “anything goes” direction of the line in it’s final couple of years (which I personally believe was much of the line’s eventual downfall), although he’s far from the most “anything goes, just stick it in the line” character we’d see from later waves! 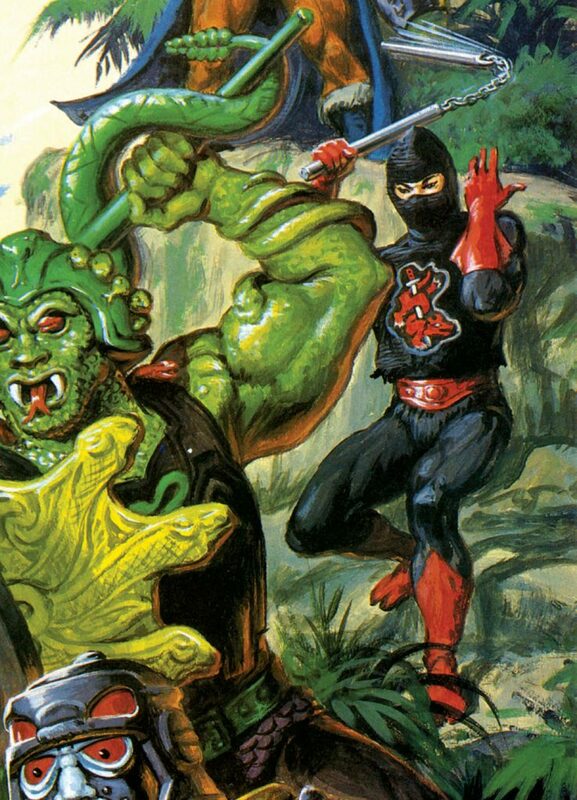 Speaking of Jitsu, I never really saw Ninjor first-hand as a boy as the line was really winding down, and many UK toyshops by that point didn’t even really carry much (if any) MOTU toys any more*; so for some reason in the meantime I had always assumed that he had a mildly re-painted (or slightly modified) Jitsu head – and there certainly are some similarities. 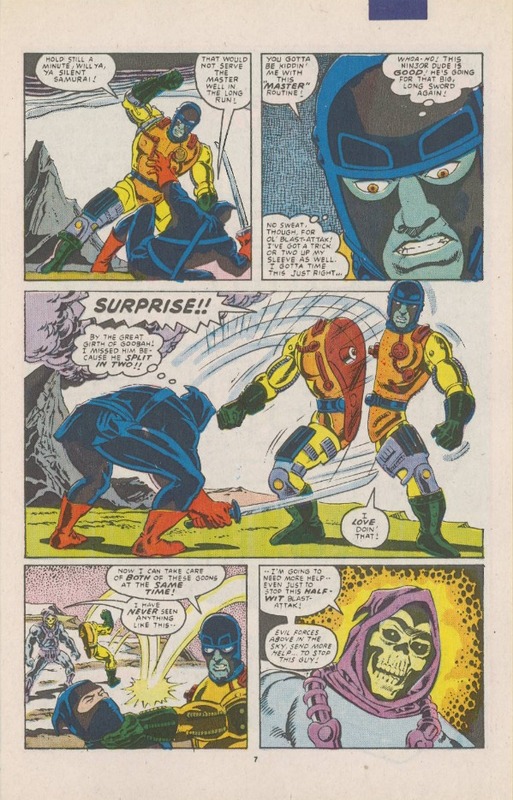 It’s maybe curious, though, that Jitsu generally seemed to be dropped into the background of the franchise over concerns of him being seen as an Asian stereotype (this was certainly why he only ever appeared in one episode of the Filmation series), but they didn’t seem too concerned about any such possible issues with Ninjor. 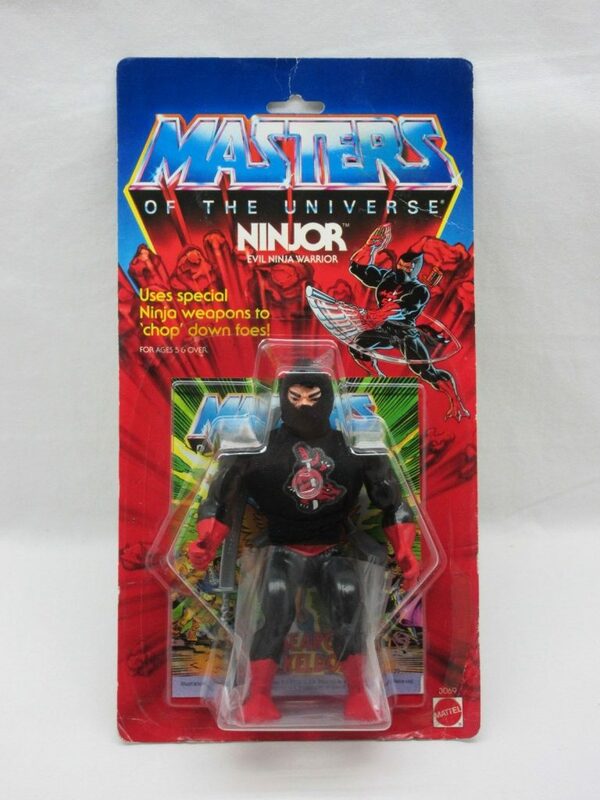 Maybe the line was so late in the day and as a result less high profile by the time Ninjor was released, that they decided they could let it slip by. 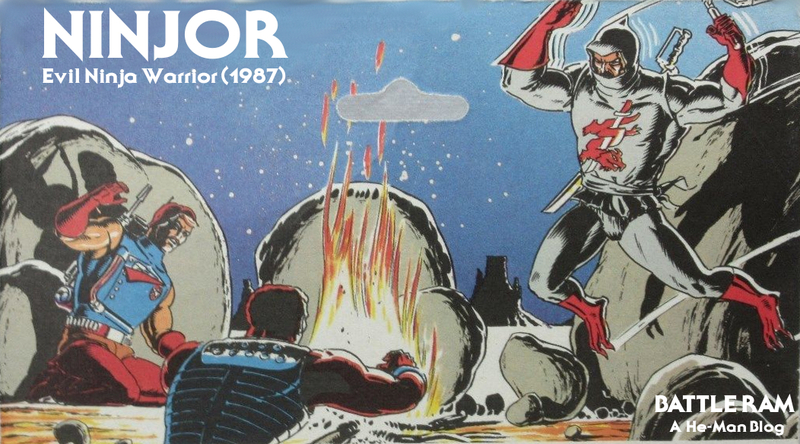 * – Back in my earliest internet days in the late 1990s, I actually did ask if Ninjor had been released here in the UK. My curiosity because for a few years, all things ‘ninja’ were effectively banned in the UK if it was aimed at children due to concerns over the level of violence associated with it, with Teenage Mutant Ninja Turtles infamously being re-named Teenage Mutant HERO Turtles for some years here; so I was curious if ol’ Ninjor had even been released to UK shelves. I was assured he had been; I presumably never saw him (that I can recall) simply due to the line really winding down by then. 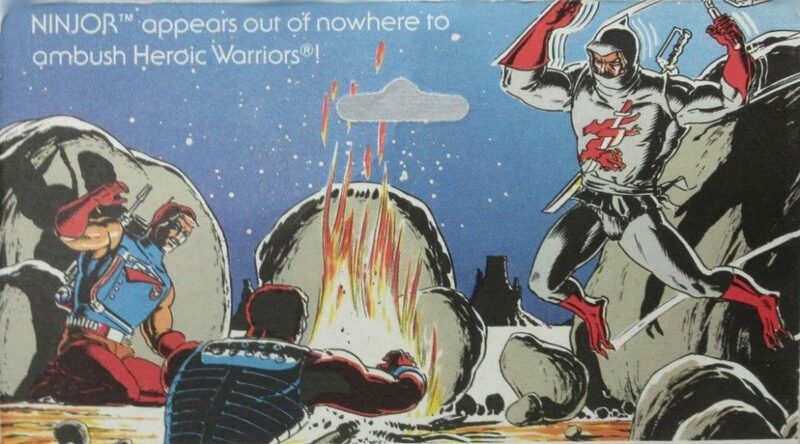 It’s also interesting to hear about the planned but ultimately unrealised white version of Ninjor. 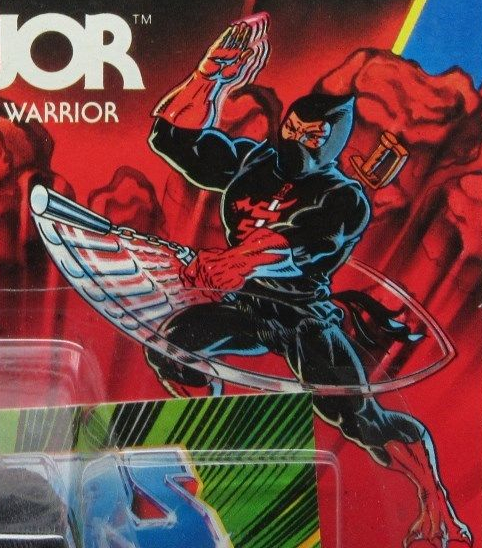 Although I have been familiar with those potential “dying breaths of the line” characters made entirely of pre-existing parts from the line art, I never actually realised this was intended to be a “white Ninjor”, I think I just assumed it WAS Ninjor. 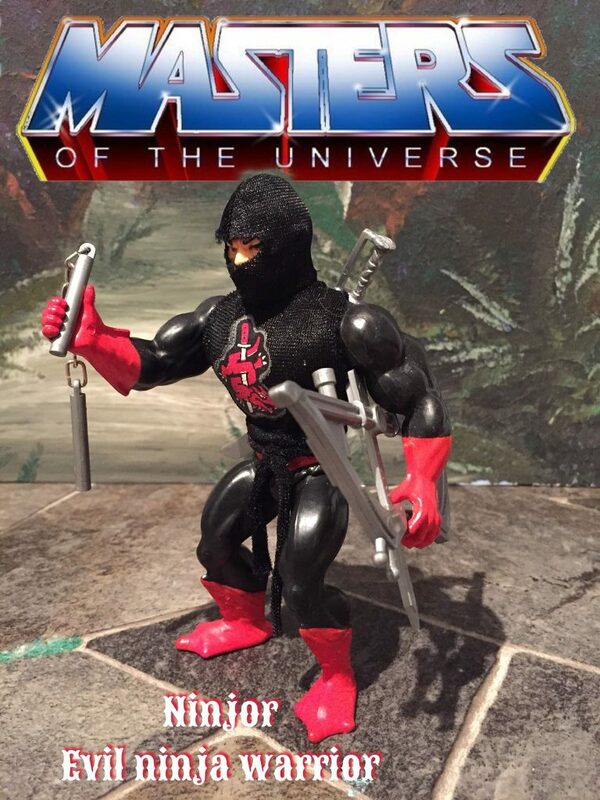 So all-in-all… Ninjor’s okay as a curiosity, as a very rare end-of-line figure (he was one of my hardest to get complete when I collected the entire line about 15 years ago now), but beyond that not really a favourite and not all that much to do with MOTU in all honesty. 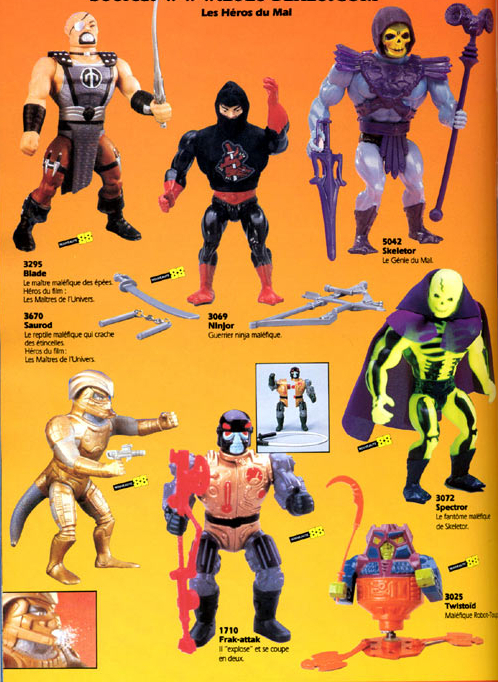 Out of the sixth wave’s slightly tired “easy to make on a cheap budget” characters, I kinda like Scareglow for his coolness and his often-debated background (which has been contradicted long before the Classics tried to give a solid bio), but in terms of Ninjor… little of any real interest to me, I’m afraid. 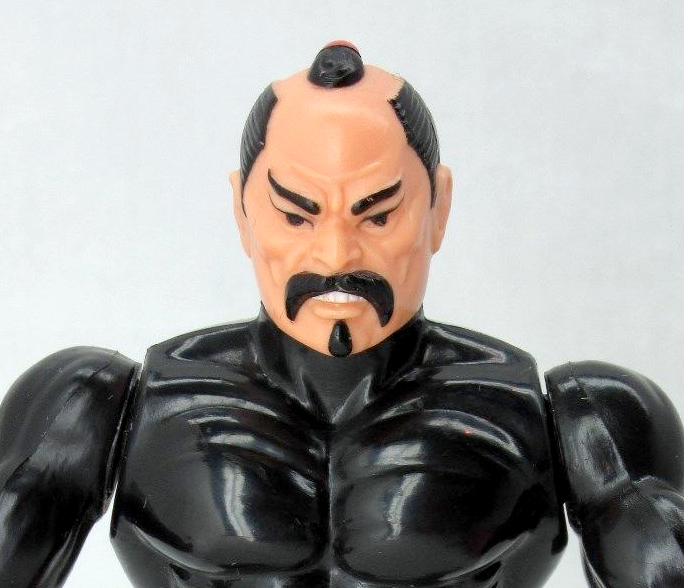 I wonder if it’s an artist/inker (probably the same person) mistake that his kinda non-ninja like chonmage was removed from the backing instructions for the ‘recolour’… (Top knot.. originally used for samurai to keep on there helmets, later used as a status symbol.. both kinda anti-ninja).. but that might be kinda a rough trace of the original ninjor art too (they look a lot like slightly edited, non-cropped versions).. which then is even more odd..
Oh and.. 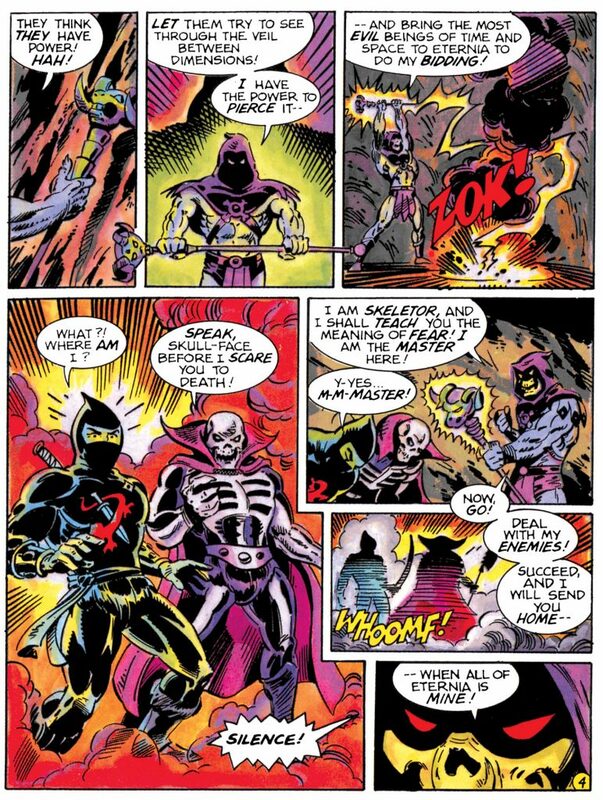 Okay.. I’ve seen it tons of times before.. but the writer of the secret of Keldor (one of the worse misnamed comics of the lot) had scare glow, a character with a Skull for a head.. call Skeletor, a character with a skull-like face (always too meatly for a full skull.. apart from the cartoons ¬_¬) ‘Skull-face’… the only way that line works is if Scare glow is kinda insulting Skeletor for the fact that ONLY his face (not his head) is a skull where he is PURE breed Skull headed! 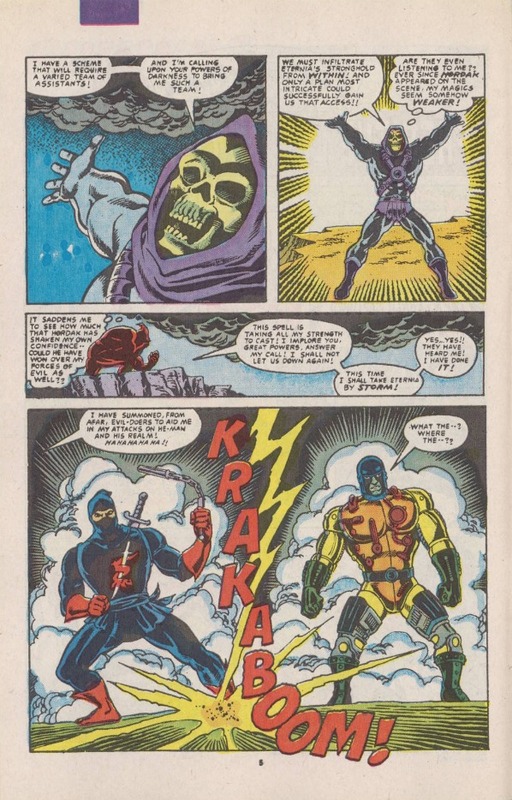 else it’s a skulled faced guy calling a skull faced guy ‘Skull-face’ in angry for no reason what so ever… pretty bad.. though that said.. I do feel it was a pretty badly written comic as it was trying to put too much into too little panel space.. 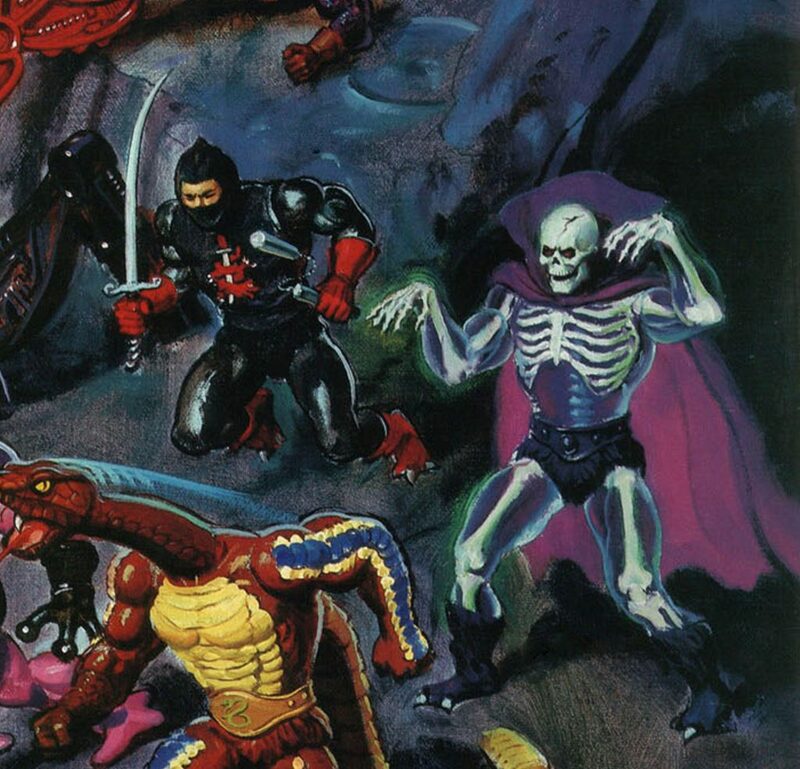 So they are shocked and angry at skeletor, he just claims he is master and shows his staff glow, and the two just bow down and lick his boots… yeah.. needed a bit more there.. but again, too limited space, too much story.. I think the Asian stereotype thing in America was a holdover from WWII propaganda against Japan. I remember seeing some of that stuff in the old Bugs Bunny cartoons as well. Took quite a while for it to disappear, unfortunately.